Amid the febrile and probably misplaced rumours about an imminent Trump impeachment, VP Mike Pence has raised eyebrows in launching his own PAC (political action committee). VPs don’t normally do it this early into a run and it is denied it has anything to do with his future political ambitions vis a vis the White House in 2020. Even barring an impeachment, health problems for Trump are not an outside possibility, given his age, unhealthy lifestyle and high-voltage Solar Arc Uranus Mars in 2018. 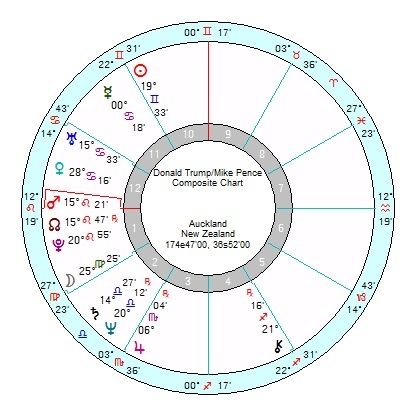 There’s no birth time for Pence, so timings are iffy, but he does have Solar Arc Sun conjunct his Uranus anywhere from 15 months to two years ahead. This will certainly send an electric shock through his life, and that could be good or bad. 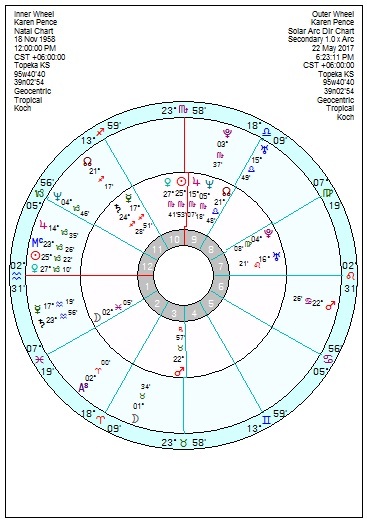 Plus he has tr Uranus opposition his Solar Arc Pluto in 2018 which is also a major upheaval. This year is majorly fraught with tr Pluto square his Mars/Saturn (= rolling catastrophes) and trine his Mars/Neptune (= dreams dissolving) – and both of these run till late 2018. 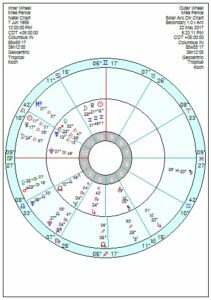 Plus he has tr Neptune square his Jupiter/Saturn running from now till late July, and on and off till late 2018, which usually accompanies career losses. Plus a really lacklustre, not-winning tr Neptune square his Gemini Sun from May 2018 till late 2019. Though tr Pluto conjunct his Solar Arc Jupiter will give him some cheer in 2018/19. But even if he did step up, he would not be a happy camper. He’ll recover by 2020/21 with tr Pluto sextile his Jupiter. 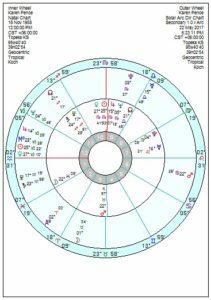 His wife Karen, also no birth time, is also facing a major setback, possibly in 2019 with Solar Arc Saturn square her Scorpio Sun. Though that can also be too much work. Some highs in 2018/19 with tr Pluto sextile her Sun/Jupiter; and considerable frustrations by 2019/2020 as tr Pluto trines her Mars in Taurus. Pence’s relationship chart with Trump is aggravated at the best of times, though no doubt kept firmly under wraps, with a hostile, power-struggling Mars Pluto conjunction – so when it blows apart it will be nasty. It looks highly confused between them this year, worse in 2018/19; though 2019 could bring relief from the chains that bind. 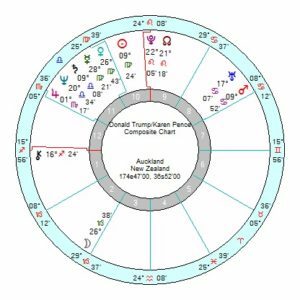 Karen dislikes Trump even more obviously with a composite Mars Uranus square Saturn Neptune. Their chemistry is bubbling uncomfortably through this year; in the freezer late this year; and into devastation territory by 2018. Two thoughts strike me. One – in the event of the Trump campaign being discredited over Russia, Pence might well be implicated since he’s been in since the start. Two – if Trump gets a whiff of disloyalty or any perceived attempt to oust him and install Pence instead, the daggers and blunderbusses will come out.